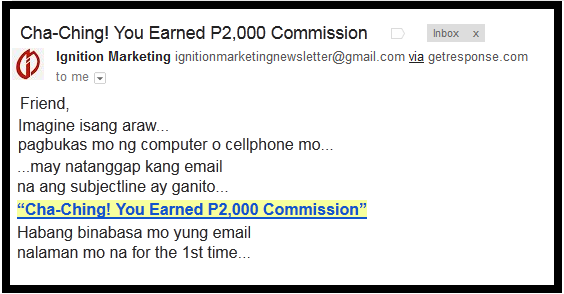 Initial Review Of Ignition Marketing Philippines: Is It A Scam, Is It MLM, Is It Legit? Last updated and edited on September 22, 2014. If you've read an earlier version of this article, you'll notice that we've modified the title a little bit. Why? Because apparently, we have different views of the term "honest". Note 1: I never expected to get quite a lot of reaction from people reading this piece. With that said, I'm going to try to answer comments and questions left by readers whenever I have the time to respond to them. You can find these updates at the end of the article as I don't want to ruin the original flow of what I've initially written. 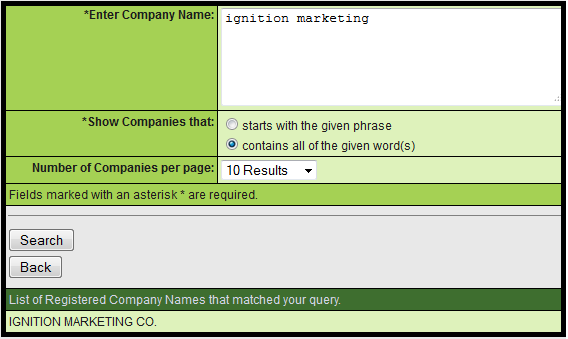 For the record, I never called Ignition Marketing a scam. I'm just skeptical of their products and business model. Note 2: As I want to be as open about this as possible, you can check out reviews by other people who has different views about the company. Search them out on Google and read their reviews. I'm not forcing my views on anyone. Just read all the opposing views (mine and others ) and make up your own mind. There's no need in calling a person "mangmang" or a moron for not sharing the same views as you. Thank you. Note 3: I will no longer be responding to comments as I simply don't have the time. You can still leave them anyway. My only request is that you stick to the issue at hand - the business, the products, the promotional tactics and the business model. We can have meaningful conversations no matter how deep we DISAGREE. I respect all your comments and opinions so I hope you extend me the same courtesy. Thank you. Ignition Marketing Philippines first came to my attention through a wall post on Facebook by a friend who is engaged in all sorts of networking businesses. I'm not a network marketer, I'm simply fascinated by the industry, mostly because of the proliferation of scams and get-rich-quick schemes and the gullibility of people who fall for them. With that said, I started investigating Ignition Marketing with the aim of understanding what it is about, what it offers, and if it's something worth investing in. I wasn't planning on putting my money on the thing even if I found it to be legit. As I said before, I'm not a fan of networking companies. I simply feel bad for the thousands of people who lose their hard-earned resources from shady companies who bait their hapless victims with promises sweetened by pictures of cash, cars, and checks. I care about these people, and I want them to be more aware about these opportunities that keep on sprouting like mushrooms online. I'm not in any way saying that networking businesses are scams. Indeed, there are legit companies that do care about their investors. Sad to say however that the scams outnumber the real ones. With this Ignition Marketing Philippines review, I plan on educating the public about the company to help them decide whether it's worth investing in or not. So here we go. There are three people behind the company - Eduard Reformina, Binsoy Basilio, and Mau Magallanes. 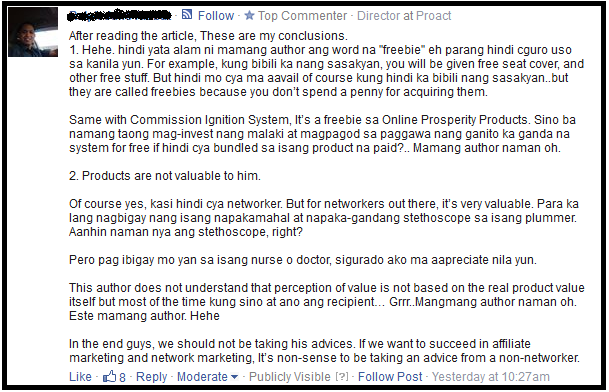 If you visit the company's website (ignitionmarketingph.com), not much information is provided about these key people. Aside from ambiguous statements about their experiences in the industry and income claims, very minimal other details are provided. As to the company itself, it's quite clear from their "Why We Exist" page that they offer both products and services. The products are training programs and tools while the services come in the form of a membership program which offers additional content and offers. If you click on the tab in their website that says "Opportunity", this window below will appear. This is what is often referred to in the industry as a lead capture page. When you enter your email address, you will receive a link to a sales video. The video is about 20 to 30 minutes long. This is the window that will appear if you arrived at the capture page through a link provided by an affiliate. For instance, this window appears if you arrived to it via a post on Facebook. I've watched the long sales video. I also registered and got into the member's page of the company's website. I didn't buy any of their products. With that said, this whole review is based on what I learned from their videos, their presentations, and other reviews by bloggers like me. I'm going to make this review as easy to understand as possible. While watching the videos and presentations, I've come across a lot of red flags that caused me to think that Ignition Marketing Ph is just another rehashed business opportunity. Rehashed products. Rehashed business model. [Definition of "rehash": to present (something) again in a slightly different form] But I have to give props to the company for a website and presentation that is both sleek and very convincing. But I'll say this, I find it very difficult to buy into their promises and claims. Take this claim for instance. Php25,000, Php50,000, or Php100,000 in a month? But I can't blame them. They are selling a business so they have to aggressively promote it. I've seen this countless of times in dozens of other videos by other companies. It's a highly effective technique in convincing people. Who wouldn't want Php100,000 appearing in their bank accounts at the end of every month, right? Here's another BIG problem I see with the company. They say that you can access their Commission Ignition System for free. That's a big lie. Let me quote Reformina from the sales video, "Gain access to the Commission Ignition System for free for only Php2,999." In short, you cannot access the system if you don't buy one of their products. You can call this a freebie, a gift, or a free offer but the FACT remains that the only way you can use it is when you spend Php2,999. How is that free? Free is when you get something without investing a single centavo. It's a really misleading claim. If you claim to give something for free, then give it for free, no strings attached. It's like saying "I'm going to give you a free banana but first you need to buy this apple." Again, this is a technique that is very common among online entrepreneurs. The team behind Ignition Marketing Philippines did their research on marketing strategies and they are very good in them. Another thing that caught me off-guard while watching the sales video is when the presenter claimed that the company is not offering an online job. What they are offering is an online job - directing people to the sales funnel and earning commissions. This is a job, period. If it's not a job then what is it? The presenter also said that Ignition is not network marketing. I don't know if it's just me but this is confusing. If you see people on Facebook sharing links and promoting Ignition, what they are doing is the very definition of networking. The company has two products. 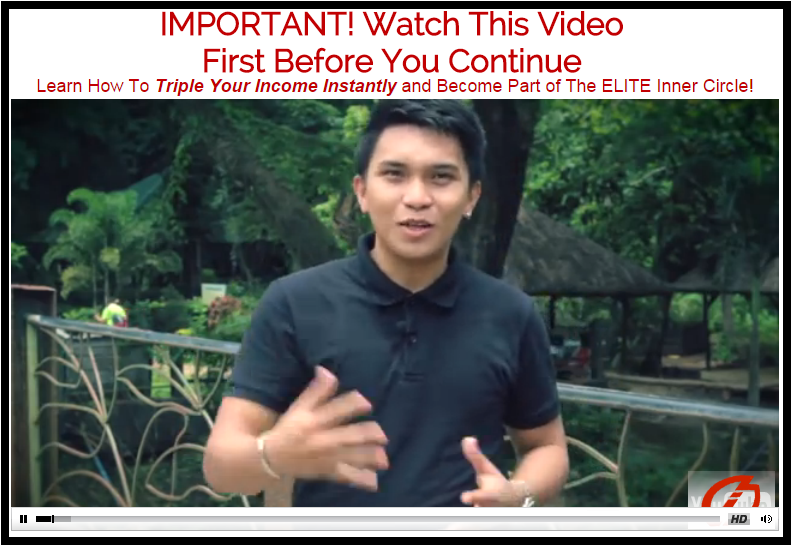 The first one is the Online Prosperity Training package which is composed of two value packs - the Fast Profit Blueprint and the Facebook Sikat Marketing. In a nutshell, these are kits that show you how to market and promote stuff online. These are worth Php2,999. The second product is a membership program called the Elite Inner Circle that's worth Php1499. As I said earlier, I did not buy any of the company's products so I can't say anything "detailed" about them. However, I'm an internet marketer myself and looking at their overviews of their products, I can honestly say that you can possibly find most of what that they offer from other online sources for free. Take for instance their Facebook Sikat Marketing kit. There are thousands of pages online about Facebook marketing that you can read for free without having to pay Php2,999. As to their membership program, there are dozens of forums and blogs out there in the web about internet marketing that can provide answers to any question you might want to ask. How do you make money with Ignition Marketing Philippines? The company basically offers an affiliate program. You promote their products and when someone you referred buys their products, you earn a commission. I'm sure you have heard of SWA Ultimate. Ignition pretty much has an almost similar business model. Take note that an affiliate program is different from an MLM payment structure. Unlike SWA, Ignition is not MLM as they don't follow the all too familiar "pyramid structure" in compensating their members. Furthermore, Ignition's brand of affiliate marketing is different from, say, Amazon's affiliate program. With Amazon, you can promote, sell and earn commissions without having to buy their products. With Ignition, you can only promote products and earn commissions only after you buy their products. A day after I registered with Ignition, they sent me an email with a title that exclaims "Cha-Ching! 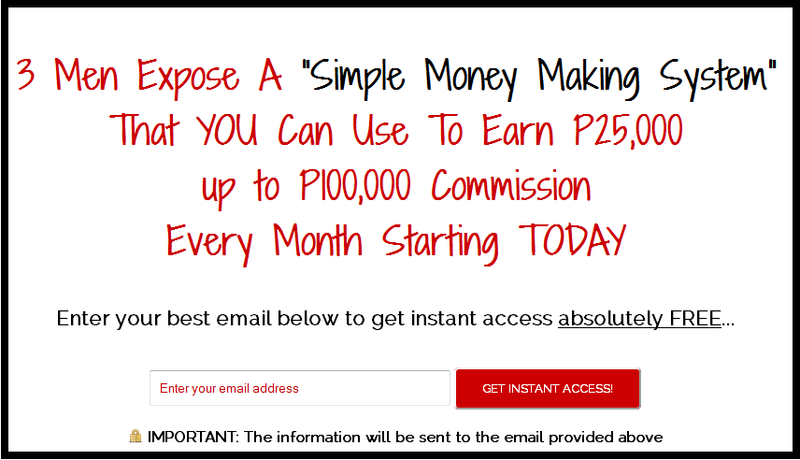 You Earned P2,000 Commission". This is another reincarnation of a very common baiting technique used by most online-based companies. You see, if you've provided your email address on the capture page, you are going to continue getting these types of emails until such time that you opt-in and become a buying member. 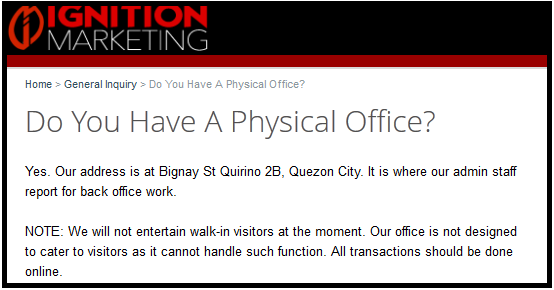 Ignition Marketing Philippines has its office at Bignay Street, barangay Quirino 2B in Quezon City. However, the company says that they currently do not entertain walk-in visitors. This is unacceptable. The business has already launched! It should be every company's responsibility to provide an office where they can address issues, questions or problems that their clients have. One of the owners of the company claims to have earned millions of pesos yet the company can't afford an office where their clients can go to inquire about things? To be fair, they are an online-based company and they can address queries purely online. Still, people are investing money and resources into their business so they should have the right to at least have the privilege of having their problems addressed personally. Ignition Marketing Co. is a registered company name in the Philippines. If you search for the company on the official website of the Philippine Securities and Exchange Commission, they are there. So they are for real. They are legit. However, as the SEC directly states on their website, the availability of any company's name on the website is not an indication that it is authorized to sell to the public. Ignition Marketing Philippines has a very well-made website. 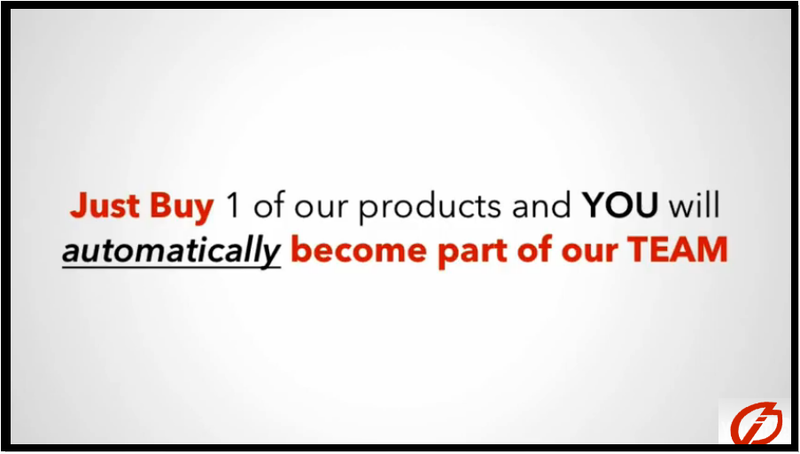 Their sales videos and presentations are sleek, neat, and professionally made. However, behind all of these is a business model that has often proved to be unsustainable. They do have products but these only serve as a front or a cloak of sorts. 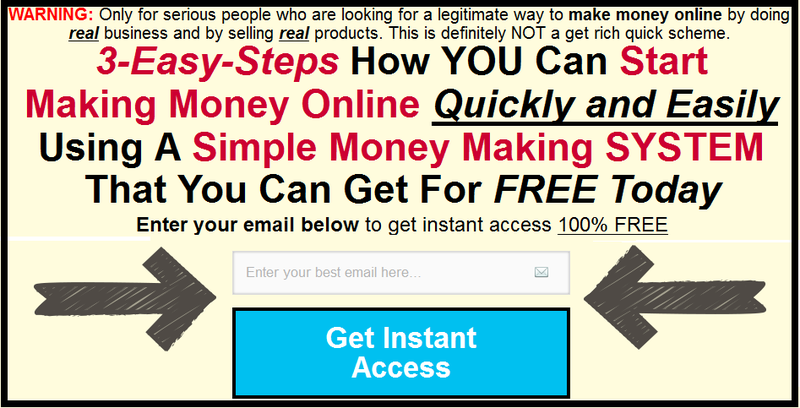 All you need to do is look at the way people are promoting Ignition online. They aren't focused in telling people that they will find value in the products. With their promotional tactics, the products are secondary. 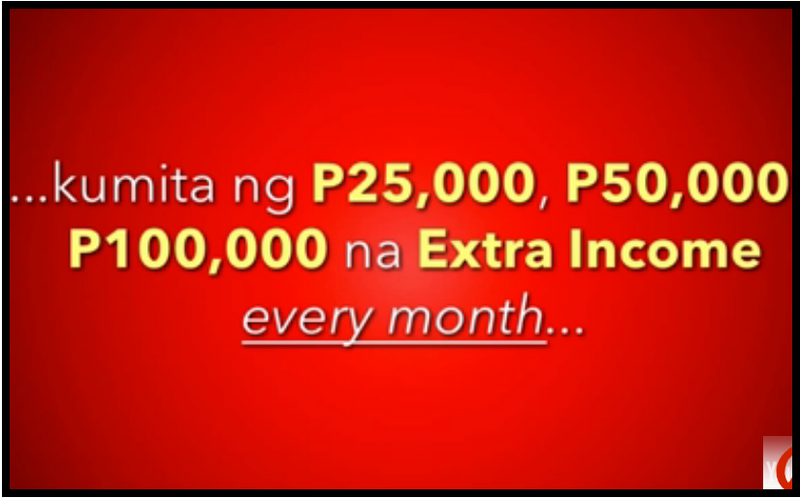 All you hear are about the thousands of pesos you are going to earn. The great lifestyle you are going to achieve. The cash rolling into your bank account every week. For a business to be sustainable, its products should offer something of value to people. Something that people will keep on using over and over again. Something they won't find anywhere else. This way, a market for the product will always be there. The problem with Ignition Marketing Co. is the fact that their main focus is on recruiting people to buy their products then encouraging these same people to convince other people to buy the products so that they can earn commissions. There's nothing wrong with this per se but as I said before, almost all online-based companies offering marketing tools and programs as their core products have the same products. They just repackaged, modified, and curated these then placed their own stamps on them. And there will always be a saturation point. Just like other businesses of this type, the products seem to only act as a means to an end when it should be the END. The bottom line is I'm not convinced by this company. I'm not saying that Ignition Marketing is a scam. They are legit and they are registered with the SEC. However, I'll have to say that their products are of very little substance, at least from where I stand. So there you go. I gave you my thoughts and observations about the company. The ball is now in your court. 1) Is Ignition Marketing an MLM company. Based on their business model, I would say no. As I stated earlier in the article, their business model is a form of affiliate marketing. You promote their products and when somebody you referred buys, you earn a commission. 2) People are questioning what gave me the right to review products that I myself did not buy. They have a point of course but if you read the article, I didn't delve into their products. The gist of what I said about their products is that I don't see originality based on their overviews of the products and I stand by such point. Anyway, I've been contacted by someone who bought the Online Prosperity Package and he says he'll let me take a peek . I'm looking forward to see what they got. I'll post updates here when I do. 3) Contrary to what some people think, I'm not here to bash anybody. I have no connections whatsoever with the founders. I don't know them. How can the Commission Ignition System be called a freebie when it's the core opportunity being offered by the company? The whole business model of Ignition is built upon this system. Using your car and seat cover example, if Ignition is a car company, it would be selling the seat cover for Php2,999 with the car as the freebie. Please correct me if I'm wrong on such an analogy. As to the stethoscope being sold to a plumber (not plummer), you do know that some if not most Ignition members are promoting their stuff to non-network marketers. In short, they are selling stethoscopes to an audience that's composed mostly of plumbers. Go to Facebook. Look at groups that have nothing to do with network marketing yet there are network marketers posting their links. For instance, I belong to a Facebook group dedicated to drawing. Yet there are people who joined the group just so they can post their Ignition links. Needless to say, it's annoying because I'm a plumber and I don't want to see people selling me stethoscopes. Okay, you have a point. However, we're not talking here about an iPhone or a movie wherein you need to exactly use or see it to be able to say something about it. For instance, one of Ignition's products is on Facebook marketing and advertising. I can tell you that I know a lot about Facebook advertising as I've been doing it. I haven't seen Ignition's Facebook Sikat Marketing kit but I have an idea of what it contains. My comments are built upon such ideas. And as I said before, Ignition's products are secondary in their business model. They are selling an opportunity first, the products second. That's what I think. Generating traffic and boosting revenue are among the goals of most if not all bloggers. We create content and we are monetizing such content, is there anything wrong with that? Is their anything wrong with trying to be compensated for something that you worked hard to research and write? Thank you. However, there's no need for name-dropping. You are a blogger yourself and you do know that there are two types of bloggers. There are those who wish to put their names out there and there are those who wish to remain anonymous because they value personal privacy. Needless to say, I belong to the latter. Let's stick to the issues and topics at hand. There's no need to resort to name-dropping and turning this into something personal. Thanks. I'm sorry but I find your argument invalid. Whether they built their system by spending Php300,000 or Php3,000,000, that's not the issue here. With such an analogy, Jollibee should also charge their customers for the money they spent in building their stores and hiring their employees. How the company came up or built the business isn't the discussion here. It's their products and their business model. You call yourself a "coach". A had a coach once and he never told me to SHUT UP when I didn't share his/her views. You have your opinions, I have mine. Respect for each other's opinions is all I'm asking. Telling people to kill themselves. I don't know where you came from but from where I came from, I was told that telling people to kill themselves isn't a very nice thing to say. As to the poison thing, that's very nice of you but no thanks. And one more thing, I find it very ironic that you find it wrong for me to try to generate some sort of revenue from this blog. And one last thing, attacking the messenger instead of addressing the issues he raised is not right. There's a term for it - ad hominim. I don't know what you're trying to point out here. If you're saying (correct me if I'm wrong) that I'm trying to mislead people using Facebook to leave comments here, you're wrong. You're barking at the wrong tree. It's just a plug-in from Facebook. If you have a problem with it, tell Facebook, not me. And of course, there's the box which you can always uncheck if you don't want your comments appearing in your profile and newsfeed. First of all, thanks for taking the time to write an extensive comment. I do believe that I've addressed most of your points in the article or in the updates and other responses above so I'm going to focus on this part of your comment. I'll say that there's a HUGE difference between an internet marketer and a network marketer. I can be an internet marketer without being a networker. With your statement, you are contradicting what one of the founders of Ignition said. In the presentation video, Reformina said that Ignition is NOT network marketing. In effect, he was saying that Ignition is an internet marketing company but it's not networking. Which is which? Which description should we take? Yours or the one by the founder of the company?